At the southernmost tip of the United States you’ll find Florida; home of oranges, Walt Disney World, and warm climates. Past throngs of tourists and citric associations lies Florida Keys, an archipelago off the coast of Florida where the weather is more tropical and the atmosphere decidedly different than it’s more popular mainland sibling. For yachters, another layer of the keys is opened up as this coral cay features some of the best diving in the Atlantic with an abundance of ship wrecks to explore and marine life to be fascinated by. In the north you’ll find John Pennekamp Coral Reef State Park in Key Largo which features a replica of Christ of the Abyss. Meanwhile, down south in Islamorada cast your line in the sport fishing capital of the world. 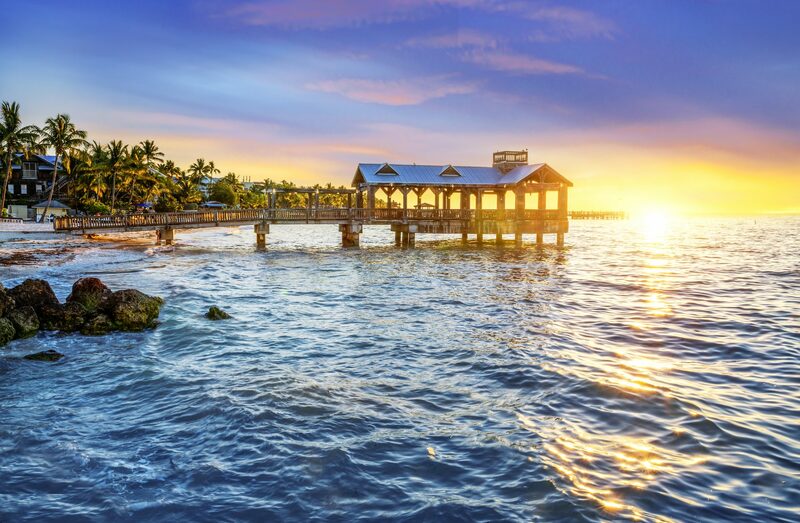 With the motto “One Human Family”, in the southernmost point of this southernmost tip, Key West, you’ll encounter a welcoming, warm haven of people and life. Embark the yacht at the Miami Beach Marina in South Beach, Miami. The crew will welcome you with a refreshing cocktail as you settle onboard thus with a drink in hand, head south to Biscayne Bay National Park. Dolphin sightings are abundant so keep your eyes peeled for a postcard perfect moment of dolphins leaping across the Keys sunset as you anchor off at Pumpkin Key. The diversity of coral reefs guarantees that you will never tire of visiting yet another. So don your scuba attire and visit one of the many reefs including: Molasses Reef, Pickles Reef, Conch Reef, and Davis Reef. After you resurface, make way for the marina in Windley Key. One of the more lively marinas in the Keys, enjoy the beaches, restaurant and boutiques by day and the animated bars and reggae music by night. True to its name Duck key is shaped like an upside down duck head. Ideal for watersports, take out your water skis, paddle boards and snorkeling gear for a day of fun in the sun. If you’re feeling less energetic, lounge on board or at the one the areas stunning beaches. Make way for Tavernier, where the yacht will drop the anchor for the night. While en route, make a snorkeling pit stop south of the Lower Matecumbe Key, facing the Caloosa Cove Marina. This channel has a colorful history as it used to be frequented by rum runners, drug smugglers and importers of illegal immigrants. Today it makes for an excellent snorkeling destination. If you’ve had your fill of snorkeling, enjoy a day of lounging on the sundeck admiring the crystalline waters. Cruise alongside Elliott Key and through the Biscayne Channel to enter into Biscayne Bay. Anchoring here for the evening will allow you to spend a final afternoon enjoying the yacht’s water toys. On your last night enjoy an alfresco dinner complete with a plate of oysters and conch fritters. Return to Miami Beach Marina to disembark.